So I’ve hardly posted anything here since the start of the year… partly due to being unbelievably busy at work for the last 3-4 months, and when you spend most of your day writing documentation, going home and writing more stuff doesn’t really appeal. Plus I’ve been in India for 3½ years now, and I think I’ve probably reached the point where I’ve already said most of the things I wanted to say about the country, and reported most of my observations about how things change when you move to a place like this as an expat. Just after moving here, I wrote that while moving to Bangalore for 2 years had been an adventure, I expected being in Delhi to be more of a challenge. 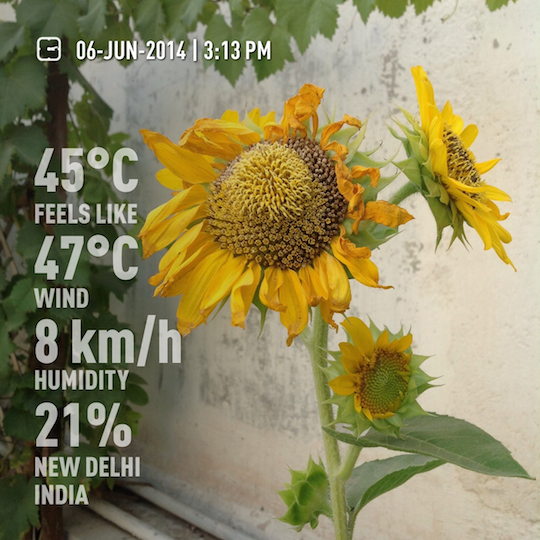 Weather (again)—Today was the hottest day in Delhi for 62 years. 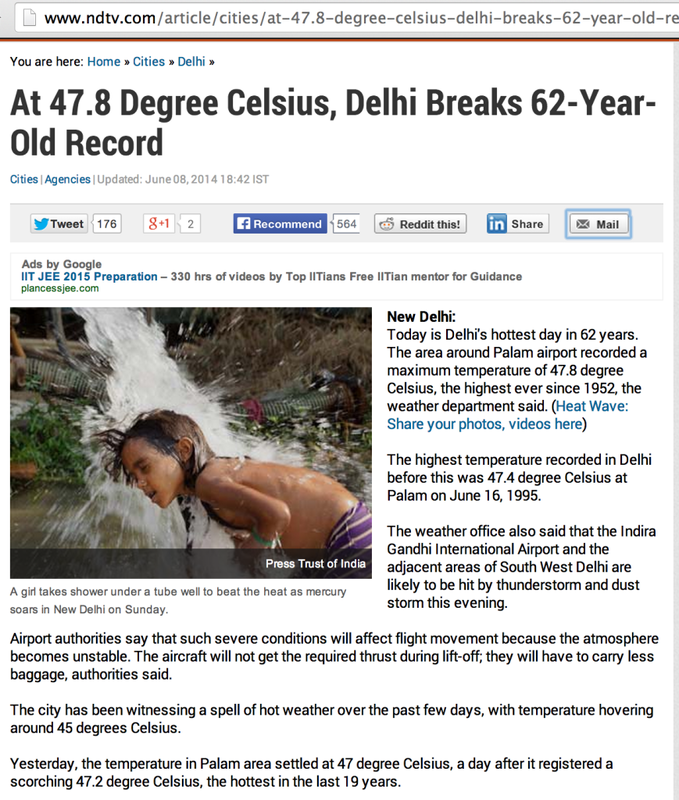 They registered 47.8 Celsius at Palam airport, although most of the city was “only” around 45 degrees. It’s been about the same for 3 days now, and some areas are suffering power-cuts, which doesn’t bear thinking about. Not being able to even run a ceiling fan, never mind a jungle cooler or a proper air-conditioning unit, would make life unbearable. Especially at night—it hasn’t been below 30 degrees overnight for a couple of weeks at least—it would be almost impossible to sleep. Dog Bite (again)—Yes, I was bitten by a street dog again this week. Just like last time, it jumped out at me from behind a parked car and before I had time to even see it, it had hold of my ankle. This time however, it was broad daylight, 6pm, and I was right in the middle of Defence Colony market, doing some shopping after work. Unlike last time I was a lot less worried… the dog didn’t draw blood and I had already had Rabies shots last year (on top of the vaccination I had before leaving the UK in 2010), so I went along to the hospital to see a doctor the next day. Also, this time I went to a nearby private hospital. 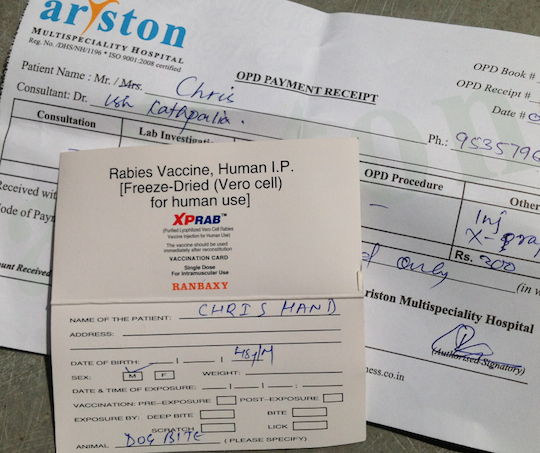 I got a jab, spoke to a doctor, and was out of there pretty quickly, after paying the princely sum of Rs 300 (£3.00). And because I’d had the course of 4 shots last year, the doc told me I only needed to have one this time to boost my immunity. 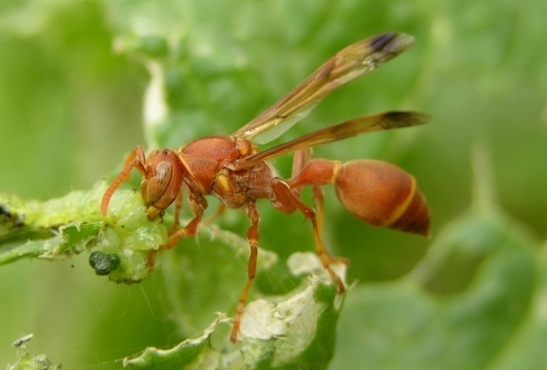 Wasp Bite (first time)—last week when the water delivery man came round with my 20L can of drinking water, he rang the doorbell but it didn’t work. I let him in, and led him across my roof terrace to the kitchen, which has a separate door. As we passed the doorbell, I was subliminally aware of something moving at me at enormous speed, followed by a huge amount of pain in my right ear. The pani-wala was waving his hands and shouting “dangerous! dangerous!” but all I could do was yell. Very loudly indeed. It turns out that there had been some wasps nesting in the doorbell, and his ringing (which didn’t ring) must have enraged one of them, and it came out and bit me. He was telling me to put lemon juice on it but I didn’t have any… a quick google suggested Aloe Vera would soothe it, and I have loads of that growing on the terrace, so after giving it a good wash I slathered it in Aloe gel and then held a bottle of iced water on it to keep the swelling down. Boy was it sore though… and for a couple of days. And now every time I see one of those wasps the hairs on the back of my neck stand up! These are some kind of Paper Wasp, all yellow/orange, with no stripes. I’ve seen one on the terrace a lot, bumbling around and always apparently looking for water to drink, directly from a dripping tap, from a saucer with a plant sitting in it, or from a puddle. I’d always thought they were fairly harmless, but I guess they’re not the same when they’re angry. Also, it was about this time last year when my doorbell went up in flames… if they are making a nest in there at this time of year (out of paper), and especially when it’s 40+ outside, it’s hardly surprising it went on fire. There’s quite a backlog of things I’d like to write about, but I never seem to have the time. Sometimes being so backed up makes me consider finding an affordable writing service to help with the load. I have several unfinished posts all sitting here in WordPress. If anyone’s actually reading this please let me know, and it might give me some incentive to get on with finishing them! Chris, I’ve been reading your blog from the start. Do keep writing, and post those drafts!